Few people are aware that there are more organisms living within a cube metre of soil than man on earth. 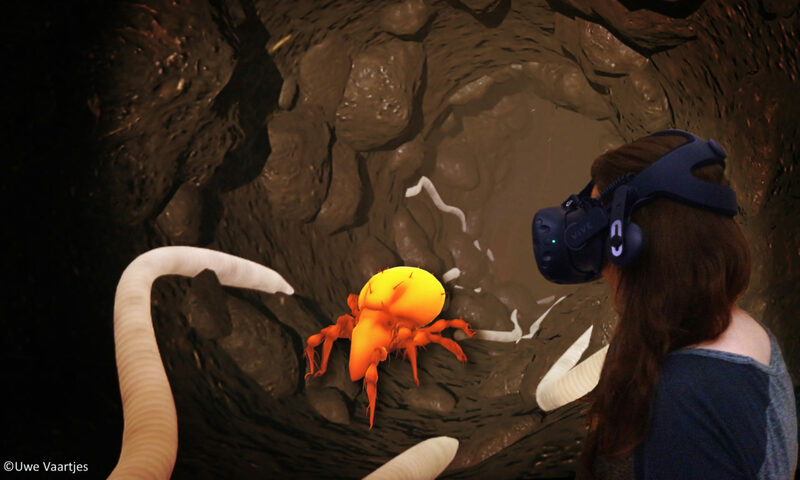 With the virtual reality (VR) experience “Adventure soil life”, the Senckenberg Museum of Natural History Görlitz brings visitors closer to the biodiversity underneath their feet; this approach reflects the research focus of the museum: soil organisms. Shrunk to the size of a woodlouse, they explore the hidden world and get an almost realistic impressions of the habitats and their inhabitants. 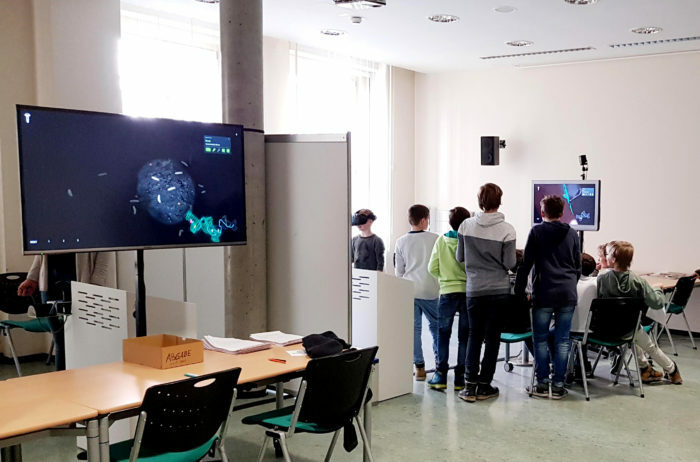 The VR experience has been created as part of the Senckenberg activities within the pilot project “museum4punkt0 – Digital Strategies for the Museum of the Future” funded by the Federal Government Commissioner for Culture and the Media. The VR is part of the international touring exhibition “The Thin Skin of Earth – Our Soils”. The development of the VR experience has been organized as an iterative process between developers of an external company (.hapto) and the taxon experts of the museum. Visitors´ acceptance and emotional perception, practical challenges and sustainable use are evaluated and documented to share these experiences with other cultural institutions planning their own VR experience. Although, the soil organisms are crucial for ecosystem services in all terrestrial habitats the knowledge about soil biodiversity is generally scarce. As research museum with a special focus on soil zoology the Senckenberg Natural History Museum Görlitz aims to provide knowledge on soil related topics to a broad public. Therefore, the museum produced and presented three touring exhibitions (from 1995 until now) to increase awareness and draw the attention of the public on the diversity, biology and importance of soil organisms, soil formation, destruction and protection as well as on soil science. The inaccessibility of soil and the small size of the majority of its microscopically small organisms are major challenges for the success of soil exhibitions (Xylander & Zumkowski-Xylander 2018). Therefore, the classical exhibitions show many models of the animals, mostly magnified approx. 200 times, as well as pictures and films of the habitat and its inhabitants. Today, innovative digital technologies such as virtual reality (VR) open up completely new, additional possibilities for dealing with these challenges. Visitors can immerse into virtually reconstructed habitats and get to know their organisms in the form of animated 3D models. Thus, not only their appearance, but also their movements and behaviour can be experienced. In a certain way, a VR-Experience can allow visitors to become part of a biocoenoses, man normally has no access to. This enables emotional accesses and advanced learning experiences which classical exhibitions could not provide (Xylander 2019). The VR experience “Adventure Soil life” has been primarily developed for Senckenberg´s current international touring exhibition “The Thin Skin of Earth – Our Soils” which was developed at the museum in Görlitz. It aims to provide visitors a close-up, intensive and emotionally appealing experience of the otherwise inaccessible soil ecosystem, thus creating added value for the exhibition. As part of the activities of our museum in the joint project “museum4punkt0 – Digital Strategies for the Museum of the Future”, further goals of the implementation of the VR experience are the provision of a detailed project documentation and best practice guides for the pros and cons of general considerations of a use, target groups, objectives, development, presentation, operation and evaluation of such educational VR experiences as well as reliable results regarding their impact. “Adventure Soil Life” for the first time offers the visitors a unique immersive experience, a visit to the hidden world under their feet, to the habitats studied by the researchers of the Senckenberg museum in Görlitz. The size ratio used (1:200) shrinks the visitors (fig. 1), in a figurative sense, to the size of a woodlouse. This change of scale and perspective allows them to explore various soil habitats and meet their typical organisms. 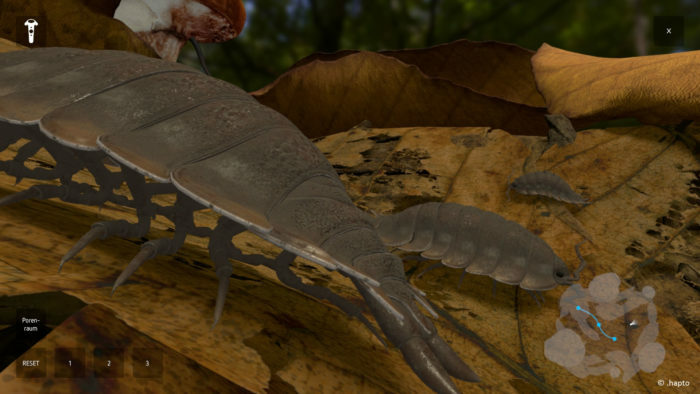 All 3D models of these organisms are realistic in terms of morphology, proportion, movement and behaviour. A 1-cent coin included in the virtual environments demonstrates the scale shift , providing a visual reference for the applied size ratio. 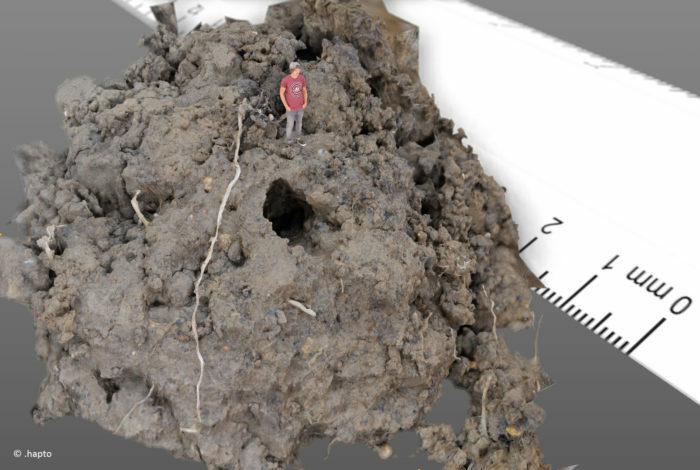 In one habitat, the “Pore space of topsoil”, visitors move through a system of large virtual tubes (produced e. g. by an earthworm) and encounter underground living springtails (fig. 2), oribatid and gamasid mites, white worms and a centipede (fig. 3). The realistic impression of being below the surface is created not only by the subsoil texture and the darkness, but also by plant roots protruding into the tube (fig. 3). Figure 2. Virtual springtail in the “Pore space of topsoil”. Figure 3. 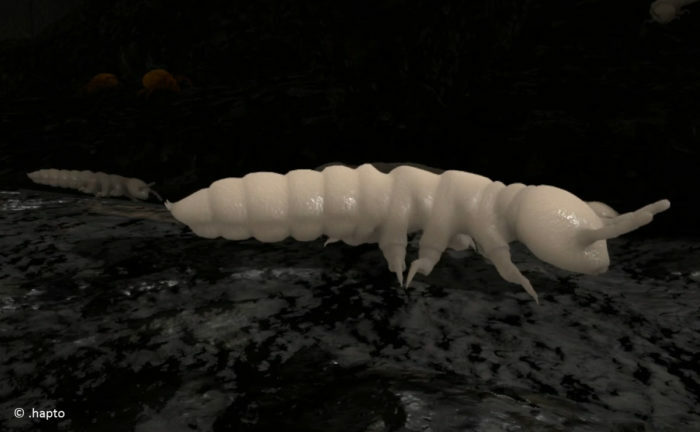 The centipede in the “Pore space of topsoil” illuminated by a virtual flashlight. The green map (bottom) is attached to the controller and can be seen by the user. The other map is visible only on the external screens. 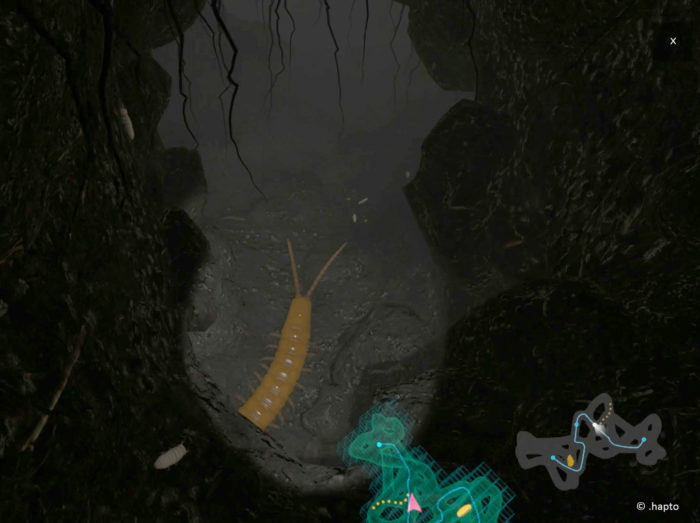 The position and viewing direction of the user is indicated by the flashlight symbol (respectively pink arrow in the green map), the centipede by the line of yellow dots. In the second habitat, the “Leaf litter”, visitors move between fallen beech leaves in different stages of decomposition. Tree canopies (from below) and mushrooms complete the environment, improving its realistic appearance to the visitors and providing an additional impression of their virtual size (fig. 4). In the “Leaf litter”, users not only meet typical litter dwelling soil animals – woodlice (fig. 5), millipede, pseudoscorpion and above ground springtails and orobatid mites – but they can also interact with some of them. Springtails jump away when touched, oribatid mites retract. This demonstrates aspects of the behaviour of these animals. Furthermore, one springtail can be lifted up and scrutinized from all sides. Figure 4. 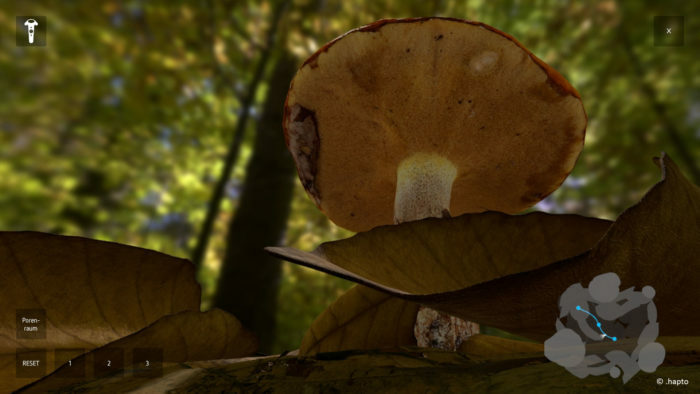 Impression of the “Leaf litter” animation (with leaves, mushrooms and the canopy) as seen on the touchscreen of the VR-terminal. The number-buttons in the left corner can be used by the staff to transfer the user to predefined points with special attractions (blue dots in the map) in the virtual habitat. Figure 5. Woodlice in the “Leaf litter” as seen on the touchscreen of the VR terminal. For further explanations see legend of fig. 4. In a first evaluation (only of the “Pore space o topsoil”) based on 1.650 questionnaires 92% of the users assessed the experience as very good (74%) or good (14%) (Baber et al. 2019). More than 80% of the users of all age groups (adults, adolescents, children) rated the experience as realistic or very realistic and about 70% declared to have a deeper understanding of soil life after using the VR. A generally increase of interest on soil organisms was indicated by 88% of the children, 41% of the adults and 22% of the adolescents. “Adventure Soil Life” has been developed to be operated as room-scale VR with a HTC Vive or HTC Vive Pro. Thanks to room-scale tracking, visitors can walk a few steps freely through the virtual world and get very close to the soil animals shown. Larger (virtual) distances are overcome with the teleportation function of the VR system by pointing at the position desired with the controller. In addition, the controller serves as a virtual flashlight in the soil pore animation and a map attached to it facilitates orientation within the virtual habitats (fig. 3). The users of the VR experience are always supported by qualified staff, that introduces them to the handling of the equipment, gives them background information on the soil organisms prior to and during the experience, prohibits misuse and cleans the VR headsets subsequently. The position and viewing direction of the user is visualized by an interface on the touch screen of the VR terminal (fig 3-6). Thus, the supporting staff has the possibility to support visitor when orientating in the virtual world. In addition, the staff can translocate visitors to predefined positions showing specific attractions via buttons (fig. 4-5). Figure 6. VR terminal with touch screen and HTC Vive. An additional large screen allows other museum visitors to see what the respective VR user experiences in the virtual world (fig. 7) . The map shows where the user is and where specific soil organisms are located (fig. 3). Thus, companions can relate the user’s reaction to what he experiences, interact with him, warn or guide him to other attractions. Thus, the individual VR experience becomes an interactive group experience and visitors are prepared in advance for the virtual adventure awaiting them. The majority of visitors evaluated this setting as an added value for use of the VR. Moreover, a vast majority of users considered the VR an outstanding highlight of the museum visit. Figure 7. Setting of the VR in the exhibition with additional large screen visible for other visitors. The development started with a storyboard written by the curator of the touring exhibition and the project team, in which the content of the VR experience (habitats, soil organisms, interactions, size ratio etc.) were summarized. During the development process, this storyboard has been detailed continuously in close exchange between the programmers (.hapto), team and taxon specialists taking into account the possibilities and requirements of VR technology and existing experience. Thus, the collected knowledge from operations of the VR in the exhibition was considered during the development thus improving the application. 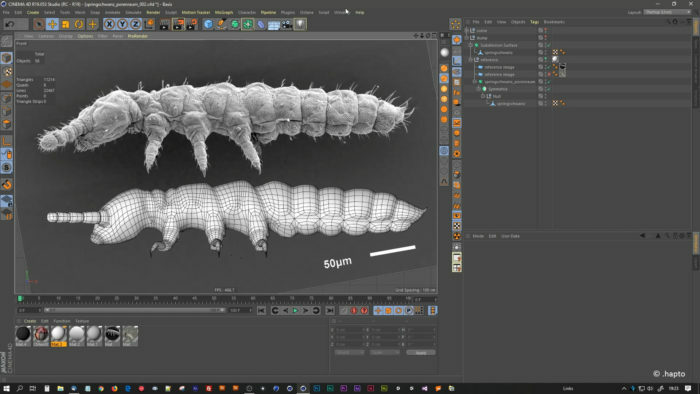 For the development of the virtual environments and 3D models of the soil organisms photos, microscopic images, scientific drawings and video material were provided for the developers (fig. 8). Prior to compiling the animation, the 3D objects created were checked for correctness by the project team and specialists for the respective animal groups. This iterative development process ensured that the VR animations are correct even in detail regarding shape, morphology, movement, interactions and taxon specific behaviour as well as size and proportions of the animals, plants and their environment. The 3D objects (environment and organisms) and animations were created in Cinema4D, the VR application with Unity3D. Figure 8. Development of the 3D model of a springtail based on an REM image. VR technology is subject to rapid development. VR glasses, graphic cards and software are continuously improved. For this reason, the development of the VR Experience took into account that it can be adapted as flexibly as possible to new and improved technical conditions. The development of a freely explorable virtual world with the highest possible attractiveness for the visitor requires high computing power. Therefore, the solution consisted of modular hardware that allows individual components to be exchanged in the future. For near future, we plan to upgrade the VR experience by including a third soil habitat. As part of the touring exhibition “The Thin Skin of Earth – Our Soils”, it will be provided to museums in Germany and abroad for the next 4-6 years. During these presentations a scientific evaluation of the contribution of the VR experience to the perception of the soil exhibition´s content will take place. Our project documentation, best practice guides and evaluation results are partly published, further publications are in advance; these documentations and research will help other institutions to decide whether and – subsequently – how to successfully develop VR experiences for the science-and-society-interaction. For our own future exhibition projects, VR is an appropriate immersive format to present items and habitats man has otherwise no access to as we see from our experiences already that this format is appropriate to open such “hidden worlds” to the public. Well planned and designed VR experiences are suitable for presenting not or hardly accessible habitats to a broad spectrum of visitors and target groups. Such presentation can be an immersive add on for the “classical” museum exhibitions. The benefit of VR formats can be maximized if they are contextualized to the exhibition and enable experiences which cannot be obtained by other formats, at least in the same intensity or quality. In addition, it is also necessary to deal critically with the challenges of their use (e.g. personal efforts, adaptation to technological improvements, support expenditure, temporary isolation of the VR user vs. museum visit as a group experience, demand of space). The development of a scientifically correct VR experience requires a close cooperation between programmer, scientist and exhibition designer and should be organized as an iterative process. Such “nature like impression” is a prerequisite for the acceptance by the visitors. The authors thank the curator of the soil exhibition and all colleagues of the project team for their creative input in the development and improvement of the storyboard and the VR experience. Special thanks go to all participating scientists of the Department of Soil Zoology of the Senckenberg Museum Görlitz for providing the numerous images and video material of the soil animals and the valuable remarks for the realistic design of the 3D models. 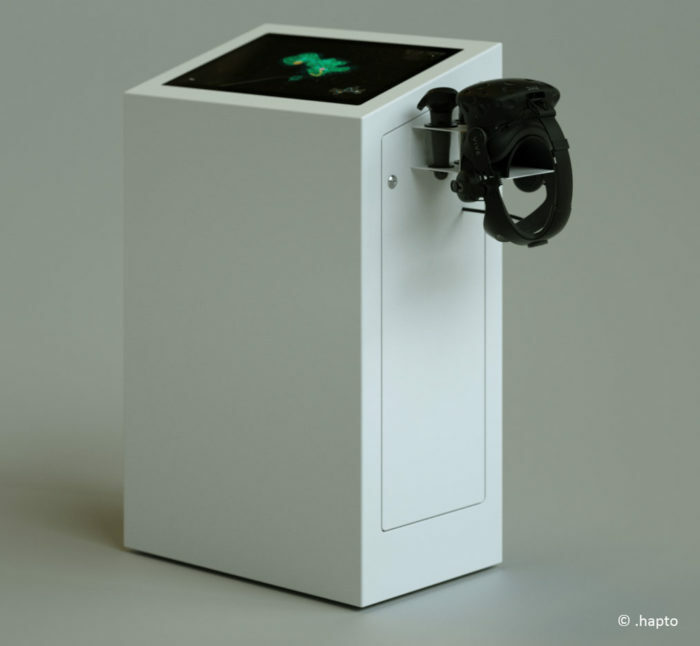 The development of the VR experience has been funded by the German Federal Government Commissioner for Culture and the Media as part of the pilot project “museum4punkt0 – Digital Strategies for the Museum of the Future“. Baber, K., Wesenberg, J., Xylander, W.E.R. 2019. Perzeption und Evaluierung von VR-Formaten im Naturkundemuseum. Natur im Museum (in press). Westermann, L., Baber, K., Wesenberg, J. & Xylander, W.E.R. 2018. “Abenteuer Bodenleben” -Virtual Reality (VR) zur digitalen Wissenschaftsvermittlung im Museum. Proceedings of the EVA-Conference, Berlin, 08.-10-11.18: 27-32. Xylander, W.E.R., Zumkowski-Xylander, H. 2018. Increasing awareness for soil biodiversity and protection – The international touring exhibition “The Thin Skin of the Earth”. Soil Organisms 90: 79-94. Xylander, W.E.R., Zumkowski-Xylander, H., Wesenberg, J., Havlik, P., Herkner B. 2018. Fast wie im Leben – Senckenberg testet virtuelle Realitäten. Natur, Forschung, Museum 148: 28-30. Xylander, W.E.R. 2019. Nicht nur, weil wir es können – Reflexionen zu Kriterien für den Einsatz von Virtual Reality in Naturkundemuseen. Museumskunde (in press). Zumkowski-Xylander, H., Pilz, M., Paczos A., Christian A., Xylander W.E.R. 2017. The thin skin of the earth – Our soils. Exhibition guide for the touring exhibition of the Senckenberg Museum für Naturkunde Görlitz (English version). Pp. 1-84.